← Reflections on the Stamford Expo. I thoroughly love starting a new horse with clicker training. It is the beginning of a grand adventure; I am confident the experience will be positive for the horse. All of my background of valuable horse clicker training experience recently came into play with a deaf 2 year old horse. At the time I started the horse, I did NOT know she was deaf, nobody did. But the process of discovering she was deaf has been quite validating for many reasons. I was called to work with this horse (and her stall mate) because she was young, mostly untrained and needed to be taught the many skill sets required of a horse living in a human world. I started in protected contact, to give her time to get used to me as well as to train the food delivery process I use. I like to use a sequence of “back of hand/flip/feed” when training horses, especially horses new to hand feeding. (For more you can download this Clicker Tip). Follow the site to the “Instant download training plans” tab. We worked it out so my hand feeding was comfortable to both of us, then I began to add the criteria of touching the target. I started clicking at this point. With our close proximity, it was very easy to get into a training rhythm and it was clear the horse was learning because she was repeating the task reliably and accurately. So far, so good and there was no reason to suspect she was deaf. I moved on to basic head forward and again because I quickly delivered the food after I clicked and the food delivery happened quickly while the behavior occurred (the reinforcer was contiguous with the behavior) I continued to see rapid progress and nicely repeated behaviors. So far, so good again. I followed with halter targeting. During this phase, I would “chuck food,” meaning, once the horse had put her nose near the halter, I would continue to give her a small amount of food while maintaining that position of the nose in the halter. Again the reinforcer was contingent AND contiguous. I did not repeatedly click because she wasn’t doing a specific behavior that needed to be marked; she was just staying basically still as I fed her while her nose was in the noseband (more in keeping with classical conditioning). All of these behaviors I had started developed nicely. I was very pleased with the halter training because she was somewhat afraid of the halter when we started and she showed improvement quickly. During this time I also used scratching as a reinforcer for standing during the stationary sessions. Next, I added touching her legs in preparation for foot care. I “chucked food” (as Bob Bailey would say) when my hand was on her leg. I would click for the leg lift, again, the proximity to her mouth made the delivery of the reinforcer quick, so there was no reason to doubt the process. There is an entire protocol which has been sometimes labeled as “manding” that I, along with Eva Bertilsson and Emelie Johnson Vegh have been lecturing about. We have also used the label of a “Start Button” to describe how we can train an animal to participate, have choice and control in a procedure. This is especially effective when training a potentially aversive procedure. While I won’t get into the specific details of the Start Button within this blog, I do encourage you to check out the process. Much of my training with this horse included developing signals that the horse gave ME that she was ready to continue with the current training process. You can see a video on Start Buttons here. So how does this fit in with clicker training the deaf horse? While I was making a LOT of progress in all avenues of behaviors being trained, I began to get a sense that I didn’t have quite the precision I’ve grown to expect, especially when I was slightly farther away from the horse’s head. Of course being further from the horse’s head meant it took slightly longer to deliver the food. I also wasn’t seeing the telltale physiological manifestations I’m used to seeing once the horse begins to understand the purpose of the click. Usually, there is an ear flick, a flash of the eye, a slight head move or SOME change when the horse hears the click. Probably one of the most noticeable manifestations people notice when a horse begins to learn about clicker training is the telltale turning of the head towards the person after it hears the click. Having the head turn a lot towards the person is something I tend to avoid in the beginning because for newbie horses it can lead to mugging behaviors. So I very carefully deliver the food in a position that helps the horse keeps its head forward to eat. However, I am still used to seeing a least a little bit of a head motion that shows me the horse clearly recognized the click. Another factor began to emerge; when we are in the beginning stages of teaching a horse an intricate training system like clicker training, I usually expect that the horse needs to learn several behaviors before it really begins to understand the system. But we had passed that introductory phase, and I just wasn’t seeing the telltale signs common to clicker trained animals. Because the horse wasn’t noticeably responding to the sound of the click I began to wonder if the horse was hearing impaired. I DID have previous experience with a horse I got when he was 16 years old. Within a few years, I realized he was gradually having problems hearing, so I went to a tactile bridge signal. But with Buck, I SAW the changes in him as he became deaf. His whole demeanor changed as he struggled to deal with this issue. The tactile bridge and the process of training with positive reinforcement were helpful to my old gelding and I was glad I could make his life more comfortable by adding a new bridge signal. With this two-year-old, she seemed quite calm and relatively easy going for a young horse. No one who had met her suspected that she was deaf. I did some quick empirical tests. I put the clicker behind her head so she couldn’t see it. Nothing. No motion or recognition. On one occasion she was sleeping when I arrived and she did not wake, even when I made some very loud banging noises on the gate. I talked to my vet, Steve Goss, who is a great vet and an outstanding individual. He had some creative ways of testing and sure enough, the tests were pretty conclusive. She was for all intents and purposes, deaf. So where does that leave us? How was I going to add the precision I normally experienced with the click? The first thing I started to do was condition a tactile bridge signal. Three quick taps on her back signaled that the behavior had met criteria and food was on its way. That process has been started and we are well on our way to revisiting our early behaviors and introducing new behaviors with our new bridge signal. It is an exciting journey for me, and I’m seeing some clarity in our training already. She is showing the typical signs of a horse who knows what a click means. We’re even beginning to have breakthroughs on some behaviors that were more difficult for her. 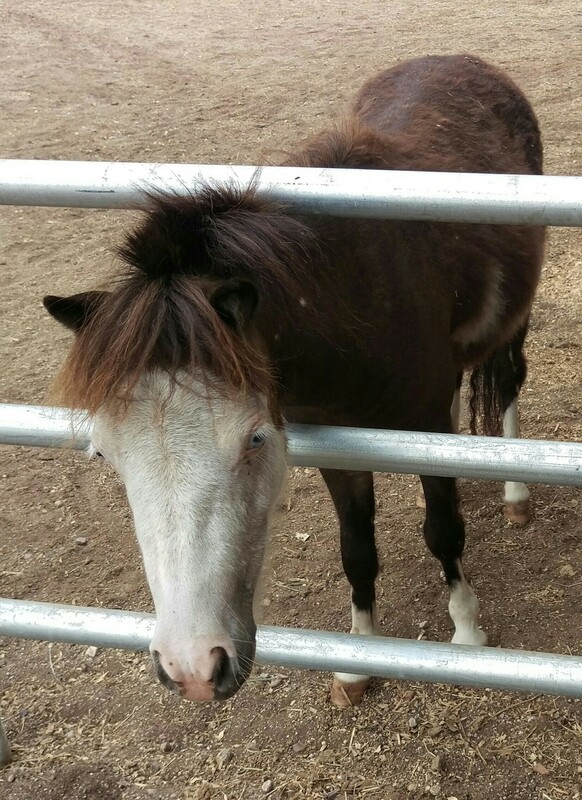 I’m hoping you’ll check in on my blog, for the process is quite informative and we’re well on our way in this grand adventure of building a reliable form of communication between this little horse and her surrounding caregivers. and has been a speaker at Clicker Expo since 2013. There’s always more to learn at Clicker Expo! I teach people and train horses using positive reinforcement. The horses I work with are given choice, the freedom to volunteer behavior. The joy is that they strive to volunteer what works for both of us. This entry was posted in clicker training horses. Bookmark the permalink. This was a great article. I think the description of what you generally see when a horse is “getting” the clicker training versus what you were experiencing with the little deaf horse was really educational. For me, contrasts like that help me learn! So thank you for sharing this with us. I would love to read an update!